They are worried that this may present a slightly more conservative approach to the risks than they are hearing from Australian scientists. In particular, they would like to see the section on variability and extreme events beefed up if possible. This email shows the role of the likes of WWF in coordinating a global consensus to stay on a consistent message. In this instance, they were worried that East Anglia report would be less scary than the Australian one. I think we could get a large group of highly credentialed scientists to sign such a letter—50+ people. Note that I am copying this view only to Mike Hulme and Phil Jones. Mike’s idea to get the editorial board members to resign will probably not work—we must get rid of von Storch too. Yeah, basically this is just a heads-up to people that something might be up here. What a shame that would be. It’s one thing to lose Climate Research. 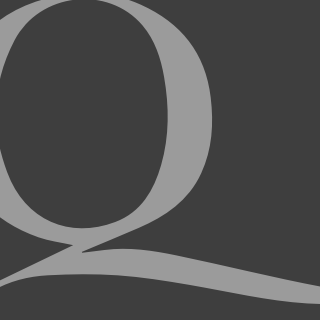 We can’t afford to lose Geophysical Research Letters. What Dr Mann was afraid of was losing control of the climate papers published in Geophysical Research Letters. This quote is from an Australian at the Bureau of Meteorology Research Centre, Melbourne (not Neville Nicholls). It began from the attached article. What an idiot. The scientific community would come down on me in no uncertain terms if I said the world had cooled from 1998. OK, it has, but it is only 7 years of data and it isn’t statistically significant. I hope I don’t get a call from Congress! I’m hoping that no-one there realizes I have a United States Department of Energy grant, and have had this (with Tom Wigley) for the last 25 years. He almost had a point with a mathematical issue, but as we all know, that doesn’t matter at all in the end. The issue isn’t whether or not he’s right, as we all well know by now, but whether his false assertions have enough superficial plausibility to get traction. In this case, they might, so it’s probably good to at least be prepared. The Geophysical Research Letters leak may have been plugged up now with new editorial leadership there, but these guys always have Climate Research and Energy and Environment, and will go there if necessary. The panel is solid. Gerry North should do a good job in chairing this, and the other members are all solid. Christy is the token skeptic, but there are many others to keep him in check. Well I have my own article on “where the heck is global warming?” We are asking that here in Boulder where we have broken records the past two days for the coldest days on record. The fact is that we can’t account for the lack of warming at the moment and it is a travesty that we can’t. The data published in the August 2009 supplement on 2008 shows there should be even more warming: but the data are surely wrong. Our observing system is inadequate. How come you do not agree with a statement that says we are nowhere close to knowing where energy is going or whether clouds are changing to make the planet brighter? We are not close to balancing the energy budget. The fact that we cannot account for what is happening in the climate system makes any consideration of geo-engineering quite hopeless, as we will never be able to tell if it is successful or not! It is a travesty! The Bureau of Meteorology has been observing and reporting on weather in Australia for over 100 years, and CSIRO has been conducting atmospheric and marine research for over 60 years. 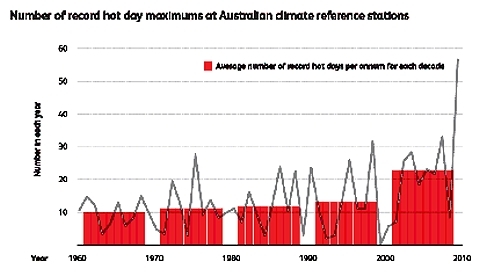 Now the CSIRO might be forgiven for not having a corporate memory more than 60 years long, but why did they and the Bureau of Meteorology only use 50 years of data to produce the following graph when they had more than 100 years of data they could have used? Well the reason they did not use a longer time period is that it would not have shown the warming trend that they needed to portray. They started their graph in the 1970s cooling period despite having a data record more than twice as long. Australian average temperatures are projected to rise by 0.6 to 1.5 ºC by 2030. If global greenhouse gas emissions continue at current levels, warming is projected to be in the range of 2.2 to 5.0 ºC by 2070. Warming is projected to be lower near the coast and in Tasmania and higher in central and north-western Australia. These changes will be felt through an increase in the number of hot days. There is greater than 90% certainty that increases in greenhouse gas emissions have caused most of the global warming since the mid-20th century. International research shows that it is extremely unlikely that the observed warming could be explained by natural causes alone. Evidence of human influence has been detected in ocean warming, sea-level rise, continental-average temperatures, temperature extremes and wind patterns. CSIRO research has shown that higher greenhouse gas levels are likely to have caused about half of the winter rainfall reduction in south-west Western Australia. Our observations clearly demonstrate that climate change is real. CSIRO and the Bureau of Meteorology will continue to provide observations and research so that Australia’s responses are underpinned by science of the highest quality. Consider the claim above that, "CSIRO research has shown that higher greenhouse gas levels are likely to have caused about half of the winter rainfall reduction in south-west Western Australia.” in the light of Figure 8 in this book showing that all the warming in the Perth temperature record in the last 100 years occurred in one year, 1976. These once-worthy institutions are relying upon a credulous public to swallow their absurd claims without question. The planet has just five years to avoid disastrous global warming, says the Federal Government’s chief scientist. Professor Penny Sackett yesterday urged all Australians to reduce their carbon footprint. The Chief Scientist’s statement is idiotic and patently false, more worthy of a Chief Shaman. There is no physical evidence anywhere on the planet that “disastrous global warming” will start by 2014, or any time at all. The position of Chief Scientist should be the last line of defence of the Australian public from the depredations of any rent-seekers and carpetbaggers. Instead she has joined the chorus that wants to condemn the Australian nation to penury. The Bureau of Meteorology and the CSIRO have failed the Australian public dismally. That is putting it mildly. In truth, they have conspired against the Australian nation. 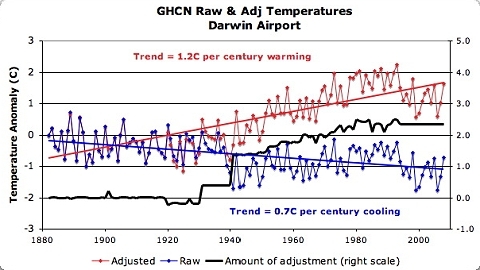 Back on the subject of alarmist scientists fraudulently concocting data, Figure 72 above shows the manipulation applied to Darwin’s temperature record in order to manufacture a warming trend. The blue line is the original raw data which shows a significant cooling trend of 0.7°C per century. The red line is the adjusted data used to promote global warming alarmism. The black line shows the adjustment applied – a total of 2.2°C in sixty years! We can see that professionals did this job, because they added a little bit of cooling in the 1920s to make the uptrend seem more significant. 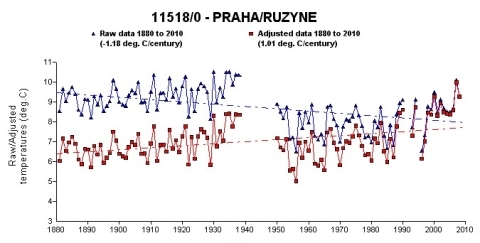 Similar to Darwin, the warming scientists added over 2.2°C to the beginning of the Prague record to change an inconvenient cooling trend into a supportive warming one. 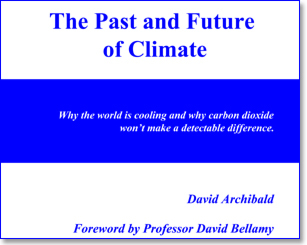 The corruption of the world’s temperature data sets by this sort of manipulation prompted the UK Met Office to announce on 25th February, 2010 that it is going to re-examine more than 150 years of global temperature records. The Met Office expects to take three years to complete the task, giving an indication of how corrupted the data set has become. Consideration of the geological record also shows that increased atmospheric carbon dioxide cannot cause detrimental ocean acidification. 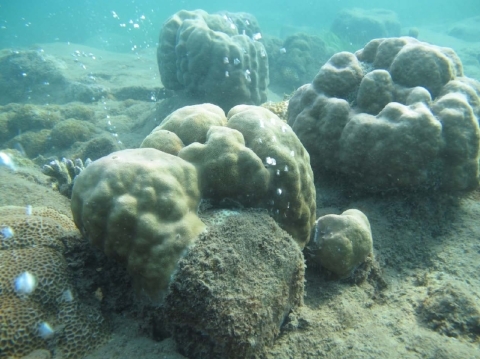 The reef-building organisms first evolved about 500 million years ago when atmospheric carbon dioxide levels were up to twenty times what they are currently.